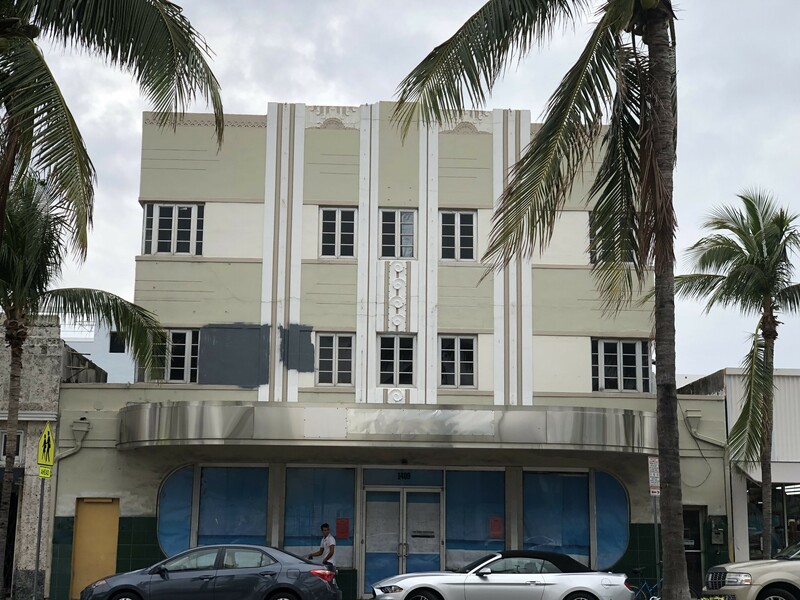 Two questions dominated this week’s twelve hour Miami Beach Historic Preservation Board meeting: When a contributing building is to be demolished, what should replace it and when incorporating one of the significant structures into new construction, how much of it should be preserved? The tone was set in a four hour hearing of an application to demolish a structure at 819 2nd Street. The one-story building appears to have been vacant since 2010. Previously, it was a three-unit rental building that was deemed an unsafe structure following a fire in 2015. Following foreclosure, it was sold to its current owner in September 2017. Built in 1923, the architect is unknown. While lamenting the loss of a contributing building, the Board was not opposed to its demolition given its deteriorated condition. 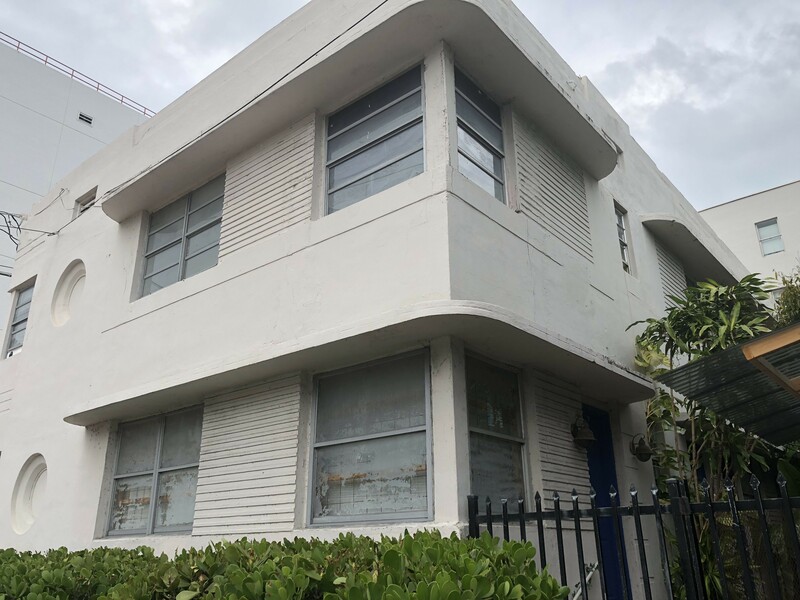 However, there was strong objection to the new plans and a little controversy when Miami Design Preservation League Executive Director Daniel Ciraldo asked to cross-examine the experts brought in by the applicant with regard to the ability to save the building. The design by architect Ralph Choeff shows a modern, three-story structure of concrete, glass, and wood (above). Planning staff objected to the design and massing of the east elevation of the building, its front, calling it “inconsistent with the scale, character and context of the Ocean Beach Local Historic District”. Ron Starkman, resident and Board member of the South of Fifth Neighborhood Association, said, “The design is beautiful." 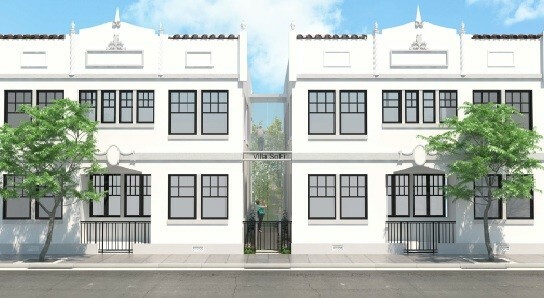 The question, he asked, “Is the design of this home so distinctive it is not compatible” with the neighborhood? He said buildings that replace contributing structures should not be “so distinct that they dominate the block”. Starkman read a letter from SOFNA urging the Board to continue the application for further consideration. Historian Jeff Donnelly said it was not a question of old vs. new but rather the “context of the block” calling for a replacement structure that is “sensitive to the language of our district”. “This is precisely what this area needs,” he said. While he was not opposed to the demolition of the current building, Board member Scott Needelman said, what matters is how a replacement structure relates to the surrounding neighborhood. “This may be too distinctive” he said of Choeff’s design. After hours of discussion, when the Board suggested following the staff recommendation for a continuance, tempers flared as owner Stephen Helfman expressed frustration at being able to get a Board of seven to agree on a design. Attorney Michael Larkin pressed for a straight up or down vote but when the Board’s legal counsel said it had the authority to continue the application against the objection of the applicant, the direction was set. Helfman and Larkin implored the Board to give them guidance as to what they wanted. The Board struggled with that request but finally settled on the staff recommendation that the front façade needed to be addressed to be more compatible with the neighborhood. After the four-hour discussion on the single-family home, the Board then spent an equal amount of time on an ambitious project encompassing almost the full block of Ocean Terrace between 74th and 75th Streets. 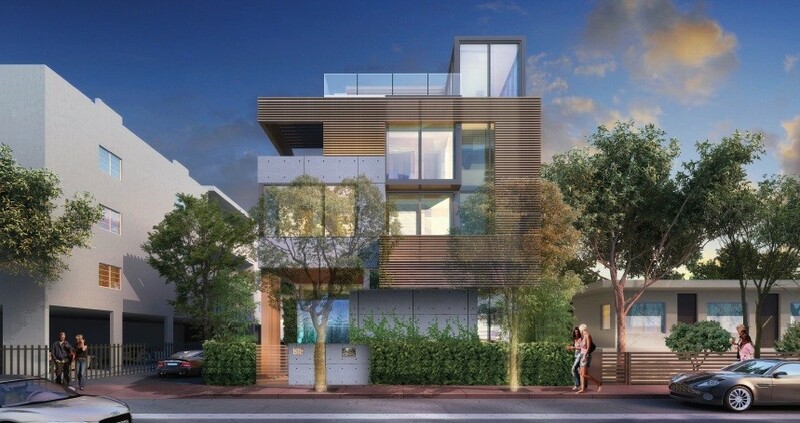 The project proposed by developers Sandor Scher and Alex Blavatnik of Ocean Terrace Holdings mixes new construction with the partial preservation of buildings along Ocean Terrace and includes multi-family dwelling units, hotel rooms, and ground floor retail and restaurant uses. Architect Luis Revuelta said the project focuses on activation of 74th and 75th Streets and the pedestrian experience, highlighting a mid-block breezeway connecting the east and west sides of the block. The proposal maintains all commercial activity on Collins Avenue while adding more retail on 75th Street. Two hotels – the Broadmoor and Ocean Surf (top) – will be restored and connected to create one hotel. Three buildings – 7430, 7410, and 7400 Ocean Terrace – will be repurposed as retail. 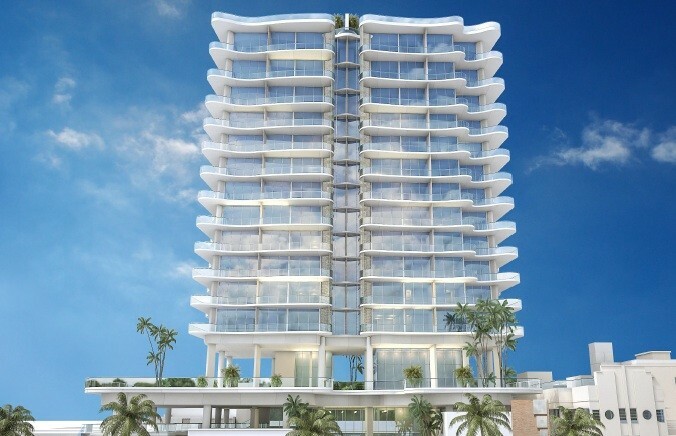 Revuelta discussed plans for 7420 Ocean Terrace, which would later became a sticking point in the discussion. The developers proposed demolishing the building and recreating parts of it to frame the main pedestrian entrance to the large residential tower (above) on the southeast quadrant of the site. “If you will recall, the original project did propose demolition of almost all of the contributing structures so this really is an evolution and I think it’s a much bigger improvement than what could have been,” Ciraldo concluded. The project nearly got hung up on the proposed demolition of the building at 7420 Ocean Terrace and the design for its replacement. While not arguing with a structural engineer’s report about it being an unsafe structure, the Board balked at allowing total demolition of the building without a satisfactory replacement design. A compromise was finally reached in which the project was approved, allowing for the demolition of 7420 with conditions for the replication of the front façade using as much of the salvaged material as possible. With the approval, the developers will begin to explore partnerships for a hotel flag. Scher told the HPB that the Days Inn brand will be removed from the façade of the Broadmoor Hotel which will be rebranded as the Broadmoor in about 45 days. The original hotel stationery was located, he said, and will be used to create the new branding. 1600 Washington Avenue / 1601 Drexel Avenue / 425 16th Street: The day had been long by the time this project came up and the Board was not interested in a plan to demolish the 1938 Henry Hohauser designed building at 425 16th Street (above). Monika Entin, attorney for owner Paul Cejas, asked the Board for guidance on how best to do that so they could come back with plans that reflected the Board’s comments. With only a few days to discuss ideas, Entin said the team believed they could incorporate a portion of the front façade into the interior of the building, potentially as an entrance to the apartments. Nancy Liebman added, “The historic building must remain.” She said she was looking for “more than a slice” to be incorporated into the project. Board Chair Stevan Pardo urged the team to incorporate the building “in a meaningful way”. He told them they would not only get a “better reception”, but that it was “the right thing to do [with a] building by a renowned architect”. Entin responded, “That is not our intent and our intent is not to give you a façade as Jack indicated earlier. It’s not to give you an appendage. It’s to make this one unified site that has retained a good portion of the historic structure and made good use of it. “Maybe it could be the whole structure,” Liebman said. “We're going to see what we can do to incorporate it in a meaningful way,” Entin responded. The Board then approved a continuance until March. Two projects viewed favorably and approved by the Board focused on restoration. 727 and 735 2nd Street: The Board approved a restoration and new construction to connect the two buildings which sit in the middle of a four-building block. Attorney Matthew Amster said his client is trying to obtain all four buildings, but in the meantime, wants to create a 14-unit apartment-hotel with the two he now owns. This is the first U.S. project for the owner who is from Chile. The South of Fifth Neighborhood Association sent a letter of support. 1409 and 1413 Washington Ave: Built in 1935 and 1936 respectively. Plans call for substantial demolition of two structures and construction of a 5-story ground level addition and a detached mechanical parking garage. Current use: residential with ground floor retail and commercial. Proposed use: hotel and restaurant.